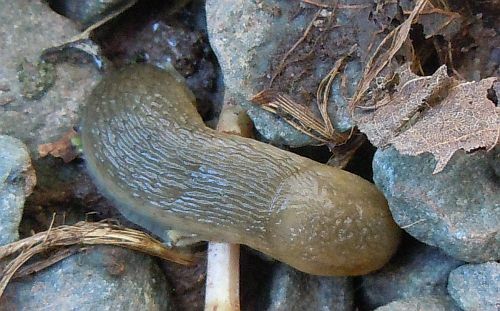 It’s peak season for summer tourists in the garden. Though the regulars are back, what’s lurking between the leaves and petals may surprise you. 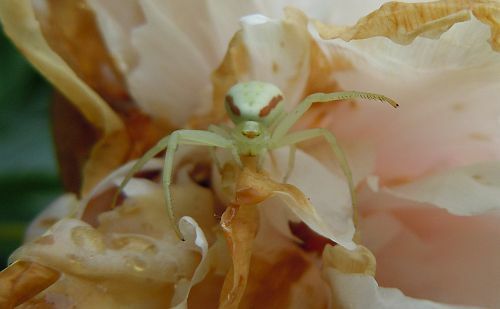 The ghost crab spider found on this fading peony is a splendidly camouflaged ambush hunter. 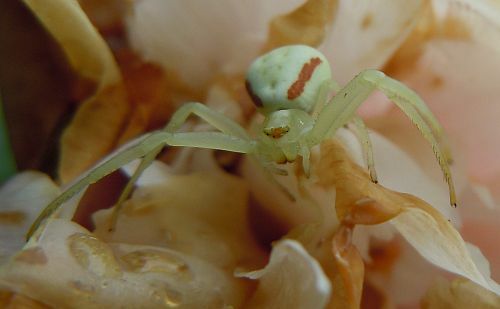 Visual feedback from its many eyes cause its color to change according to its surroundings. 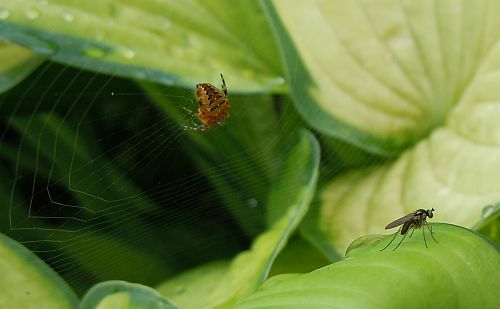 Meanwhile, back on the hosta plant, this fly doesn’t seem to be buying the spider’s line… at least not this time. Perhaps it’s already had its fill of summer romance. “Come into my parlor” said the spider to the fly. 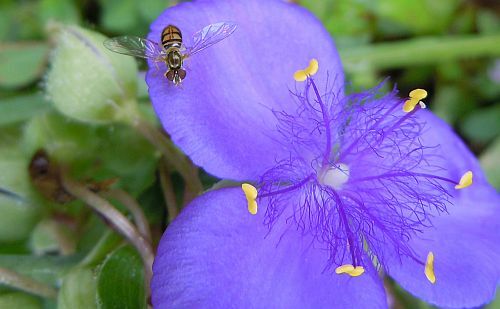 A hoverfly is more forward in its approach to the last of the purple spiderworts to bloom. 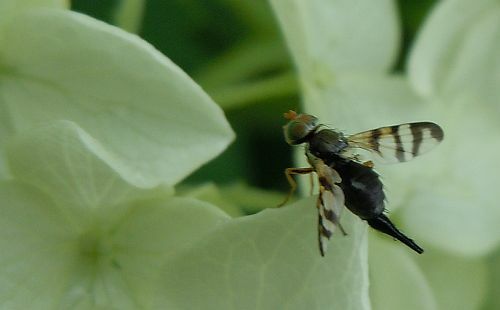 Although this adult hoverfly is looking for a taste of nectar, in its larval stage it likely ate its share of aphids. 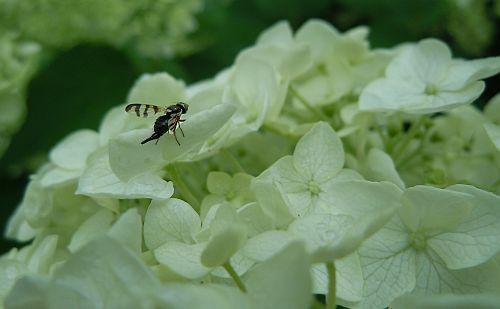 Fresh hydrangea blooms look inviting to a fruit fly in search of sustenance. Or could this visitor just be looking for a nice quiet place to rest its wings for a moment? 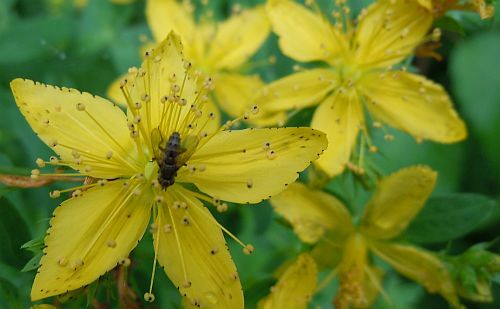 This fly is focused on the nectar of a yellow St John’s wort. 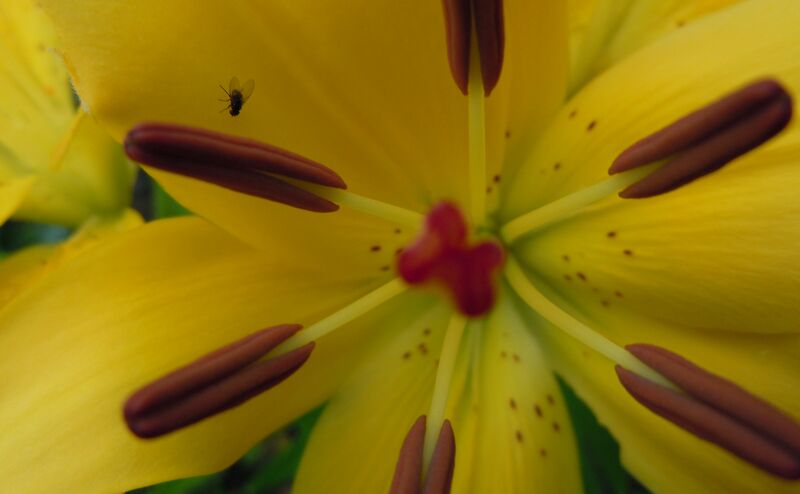 A recently opened lily already has a visitor walking along a petal towards its inner sanctum. Surely flowers must find the never ending flow of visitors tiring. 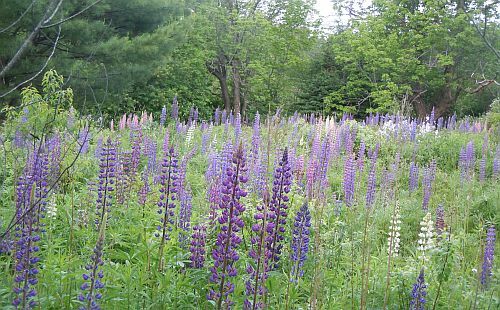 But even though they might be tempted to utter ‘Come again when you can’t stay quite so long,’ flowers benefit from insect activity for much of their pollination. And that’s reason enough to tolerate visitors, even those who prey on other guests. 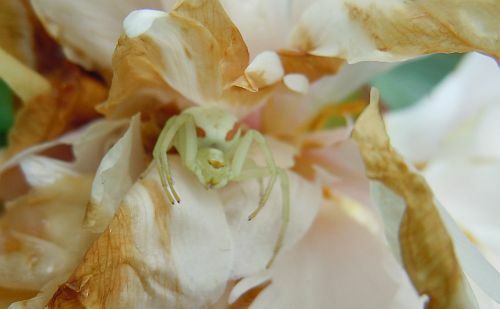 For more on the crab spider in Canada, see The Nature of the Hill’s Goldenrod Crab Spider post. Cindy in the Swan Hills of Alberta has also included a cool video from Green Nature. 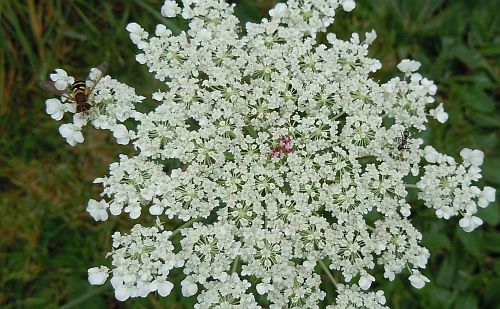 How does such a delicate flower as the Queen Anne’s Lace manage to continue looking so fresh so late in the season? Though it’s a favorite of many, few have looked deeply enough into the heart of the flower to see its deep red center. Could the secret of its youthful bloom be found here at its heart? What makes one flower stay fresh well past summer while others close their hearts to the cold winds and rains that are so much a part of the autumn of life? Why do some choose to retreat into themselves while others practice a hospitality of the heart that judges not visitors and welcomes all? These are just a few of the questions worth asking on a quiet and sunny Sunday in October. Canadian Thanksgiving Day is just around the corner. May you all find lots of things to be thankful for and questions worth asking. 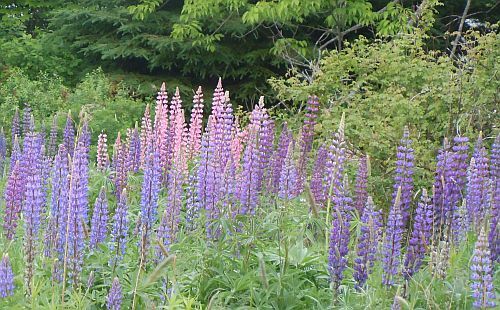 Waves of purple, pink and white lupins splash across Nova Scotia this time of year. Their spires decorate the wayside and abandoned fields. 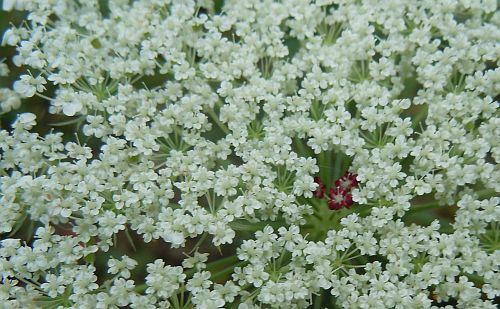 Although they’re not our provincial flower (the mayflower is), their image is often found on postcards and their seeds are sold at shops catering to tourists. 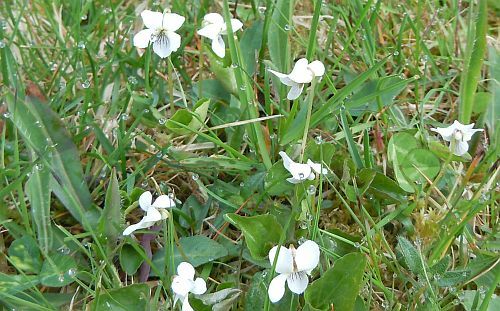 Violets have been blooming in the woods and yard for the past few weeks. 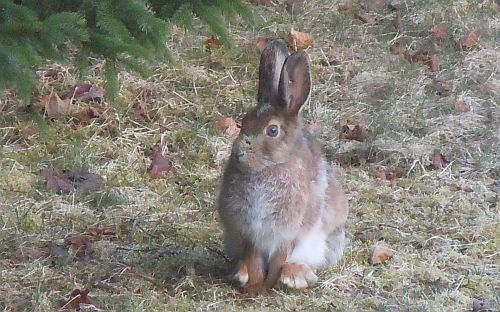 Their time is coming to an end… Soon I’ll be able to mow the lawn without having to worry about cutting them down. 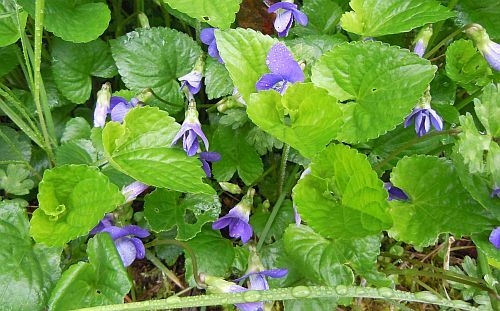 Tame violets, on the other hand, are a deeper more showy purple with large leaves that are easier to spot in the flower bed. 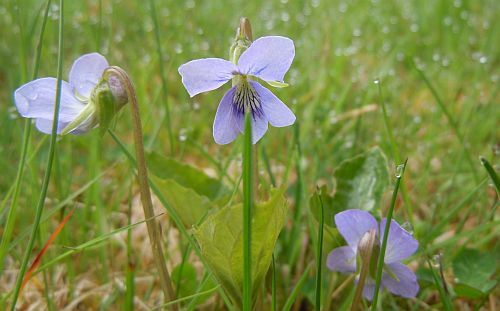 If you have the patience to pick them, wild violets are edible and an aromatic addition to teas. They can be dried or eaten fresh. 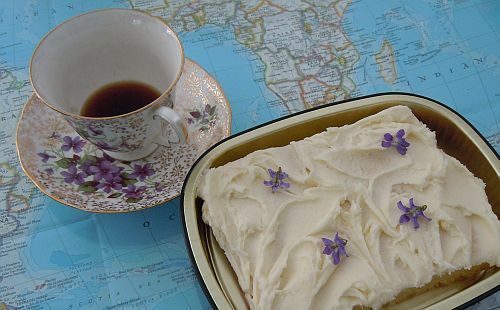 Violets are a reminder of slower times, when people took a moment to take notice of the gentler arts on a regular basis. 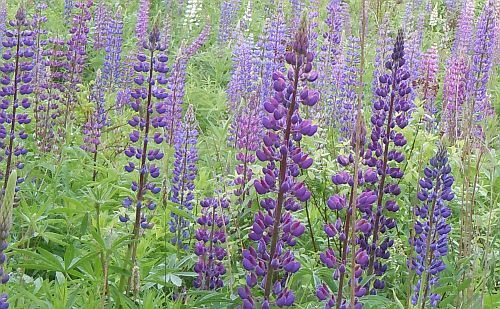 Wouldn’t it be nice if we could make an effort to take back some of these enjoyable moments, if only each year at Violet Time. 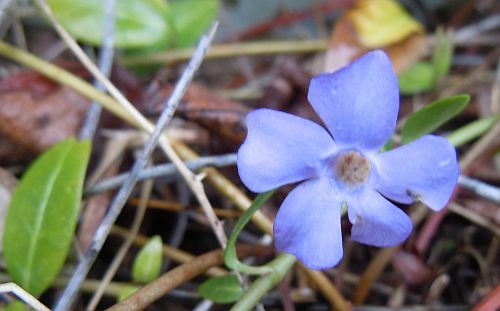 You can learn more about the Manners of Wild Violets in a previous post here. Sometimes it’s difficult to tell one cat from another, especially if they’re plants, not animals. 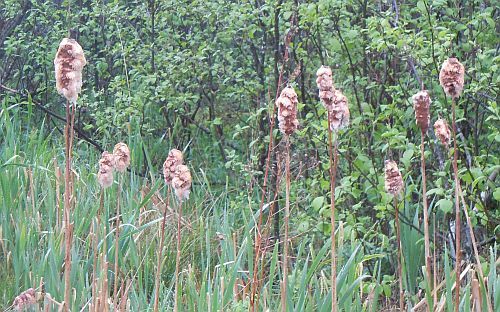 In the spring, last year’s cattails look shabby and ragged. 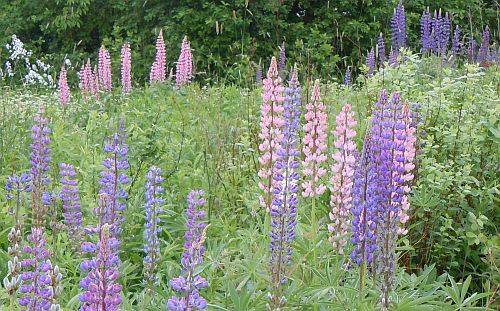 An aggressive native species, colonies of this spike-like plant are commonly found in ditches and freshwater wetlands. 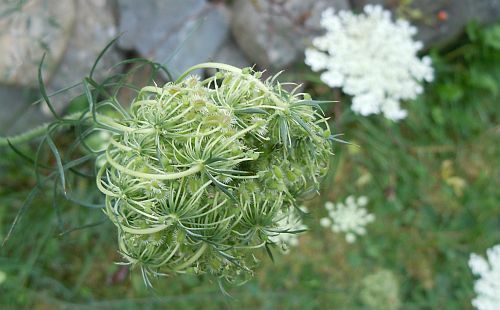 The soft down-like seeds are easily dispersed by the wind. 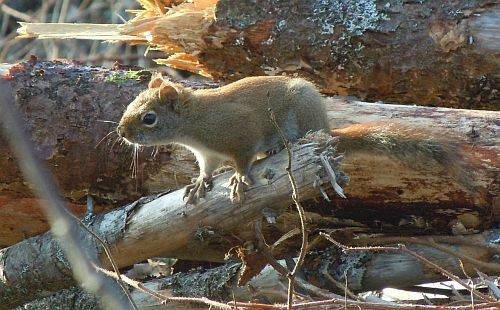 Besides being employed by birds to line nests, the down was used by First Nation’s people as a firestarter and to line moccasins and papooses. Many parts of the plant are edible. (For more see the Wikipedia page for Typha at http://en.wikipedia.org/wiki/Typha) New green cattails will appear later this summer and turn brown as the season progresses. Cattails growing in a ditch. Cattails are often confushed with catkins, the male (and sometimes male/female) reproductive part on some trees and bushes. 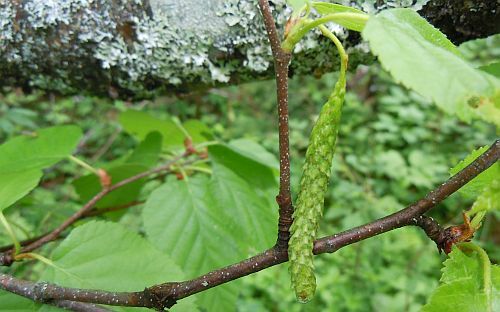 Below are catkins on an alder tree. 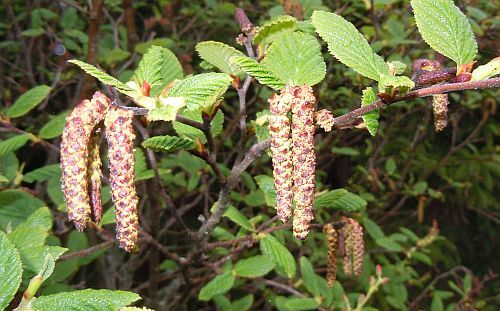 The word ‘catkin’ is derived from the Dutch word for kitten. In late spring, these catkins certainly look like kittens’ tails. 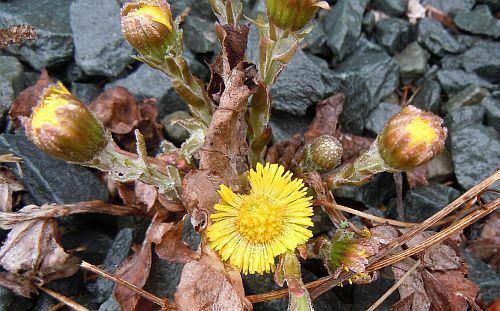 In the next image, you can see the greenish catkins as they appeared earlier this spring, hard and closed. Also visible on the leafless branches are small brown cones leftover from last year. 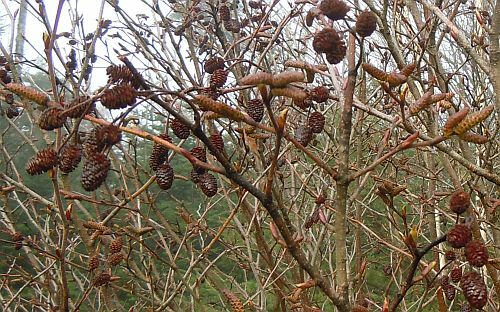 These cones hold many small seeds that are a favorite of chickadees. 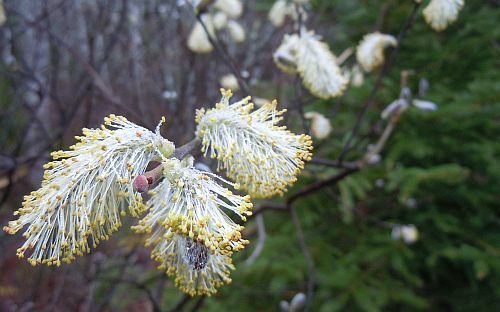 Below are the pussywillows that are such a welcome sight in early spring. Their soft grey fur invites petting by young and old. As a child I recall my first grade class glueing these to an image of a kitten to provide texture and color. 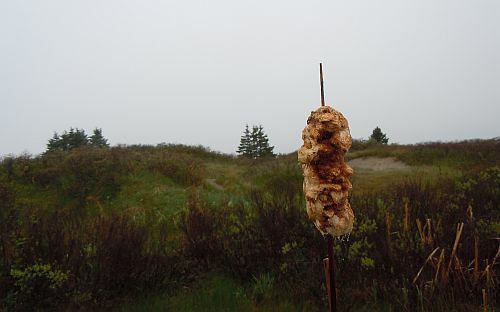 It was a common craft back then when most children had access to pussywillows near their homes. 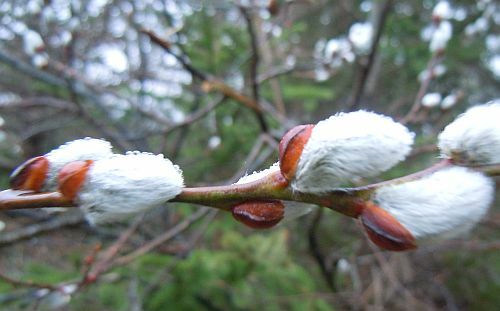 Pussywillows are a type of catkin growing on willow trees or bushes. Eventually, they go to seed and appear quite different than when they first emerged from the branch. 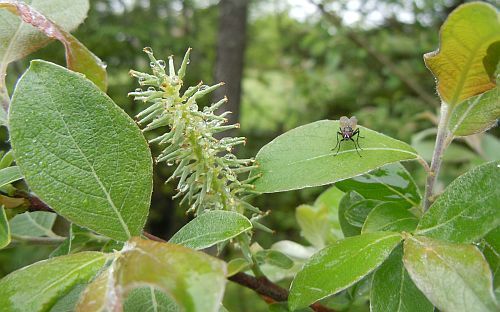 By now, it’s difficult to find evidence of pussywillows in our woods. 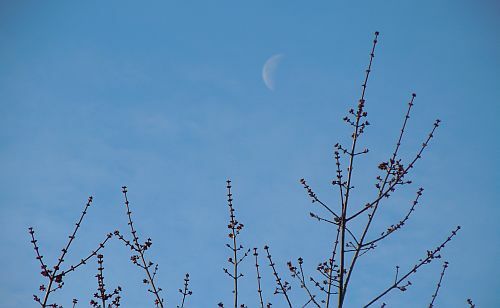 However, fresh green catkins can now be found on the yellow birch trees. With such staggered and changing appearances, cattails, catkins and pussywillows can seem as mysterious as their feline namesake. Perhaps that’s part of their charm.